(NaturalNews) Concepts explored in books and movies, particularly in the science fiction genre, often have a way of seemingly predicting future events. One of the more popular current memes — the "zombie apocalypse" — is the perfect example of this phenomenon. 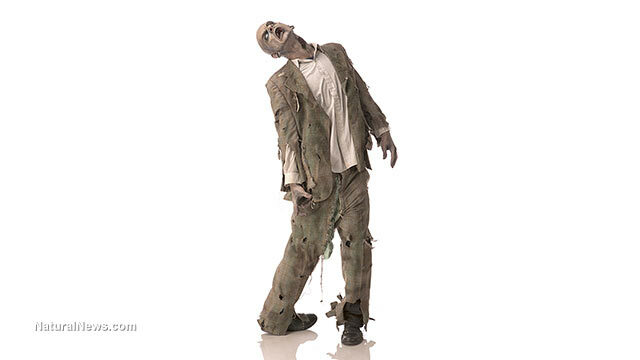 As a recent article in The Washington Post points out, the streets of America are increasingly becoming filled with hordes of what can only be described as "deadwalkers" or zombies. We're talking, of course, about the millions of Americans who cannot take their eyes off of the ubiquitous hand-held mobile devices that almost everyone carries around these days. The practice of staring at smartphones and texting while walking has become so widespread that people have now become a danger to themselves. Everyone knows that texting while driving is dangerous (although many continue to do it), but so many people nowadays are walking the streets with their heads down and their attention focused on their phones that texting has become a real danger for pedestrians, too, and not just for those who drive automobiles. "By now, everyone knows that talking or texting while driving can get you killed. But the fact that 3,154 people died and an estimated 424,000 were hurt in 2013 is evidence that a great many people are willing to ignore the advice to keep their attention on the road. "News that you could get hurt or even die while walking around — made oblivious to your surroundings by your cellphone obsession — isn't very like to be more persuasive. But there is plenty of anecdotal evidence and an emerging body of research to back up those warnings." There has been a steady increase in the number of people admitted to hospitals after being injured while paying attention to their smartphones and not to their surroundings. The number of pedestrians injured while using phones multiplied six times from 2005 to 2010, according to a report by the National Safety Council. Deborah Hersman, head of the Council, says that the number has likely increased "quite a bit" due to the "rapid explosion and proliferation of these devices" over the past five years. Many doctors and surgeons would agree. For instance, Alan S. Hilibrand of the American Academy of Orthopaedic Surgeons says: "Some data suggests that at any given moment on the streets of America, 60 percent of pedestrians are distracted while walking, meaning either on the phone or doing something on their phone." But the accidents aren't happening only on the streets. Surprisingly, the National Safety Council report found that half of these phone-related injuries occurred while people were walking in their homes and talking or texting on their phones. "We're dealing now with an addiction to these electronic devices that is, frankly, all-consuming. When something beeps or buzzes or dings or vibrates, it really is as compelling as someone tapping you on the shoulder. People are being conditioned to engage in these activities and they get immediate gratification for that. Our brains get a hit of dopamine every time we open a message." And so, it appears that the much-anticipated and dreaded zombie apocalypse is already here. However, while fictional zombies often pose a threat to others, the real-life walking dead we have littering our streets are mostly a danger to themselves.